I'm really cutting the deadlines close this challenge! Phew! Haha. Good thing this is the last fill: gardens/butterflies! I originally planned to do a butterfly wing mani since I haven't done one in a couple of years, but time and necessity had me turn that into stamped flowers with my first attempt at a leadlight mani. Let's take a look! I wanted to do this look with a bunch of shades of blues/purples, so with that in mind I used a pale blue (Formula X Infatuated) as a base in place of a white. I then stamped some flowers from Born Pretty Store Plate QA83 with Sinful Colors Black on Black and used some of the OPI Sheer Tints (Don’t Violet Me Down, Be Magentale With Me, and I Can Teal You Like Me) to do a leadlight technique - basically colouring in a stamp after it's on your nails with sheer/jelly polishes! 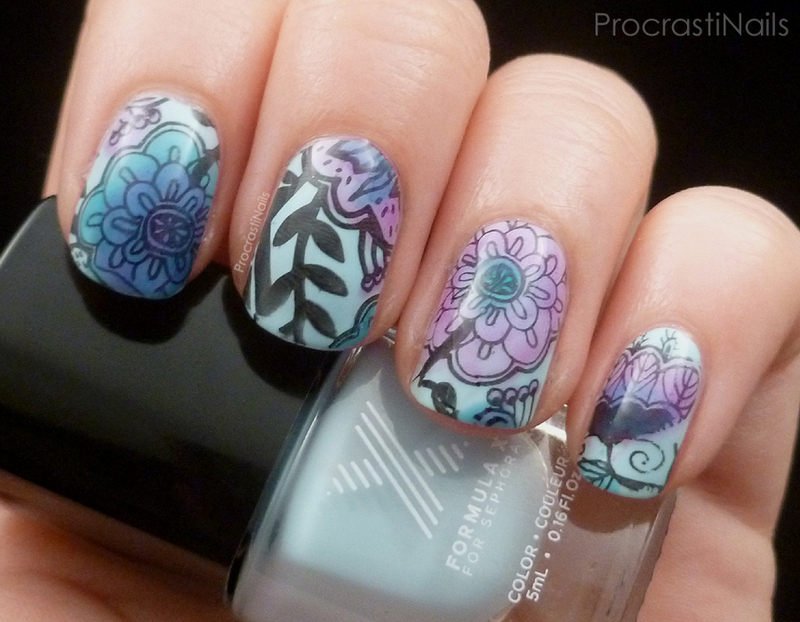 I like how all the shades worked together into gradients on the flowers. This isn't the mani I had planned, but it's the one I have and I'm pretty happy with it. :) This is definitely a technique I want to use more in the future. And that's it for today! 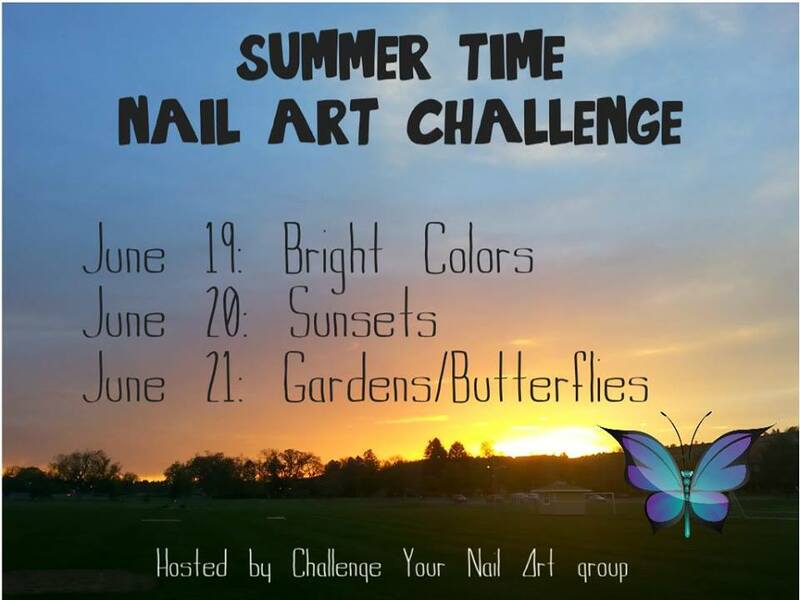 If you're interested in joining us for our next challenge you can check out the Challenge Your Nail Art group on facebook - it's made of up of lovely supportive people, and we all get input on what kind of challenges we want to do! This looks nice! 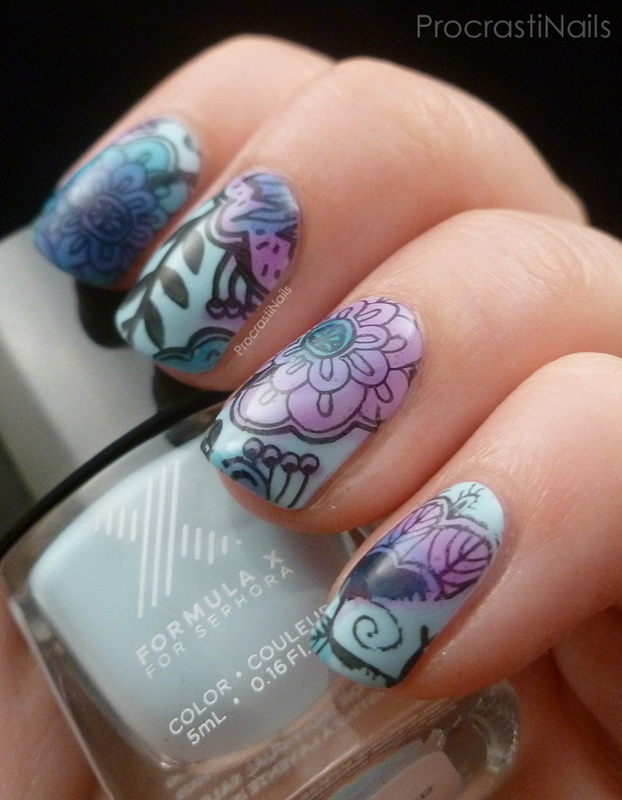 Funny enough, I was planning to do a leadlight manicure with the same stamping plate too! I haven't attempted it yet but I need to give this technique a try. Love the leadlight technique and you did a great job with it! So pretty! Great job with the leadlight.. and I really love that blue you chose for the base, too.